What if I Have a Missing Crown on My Chimney? Chimneys need regular maintenance over time. Chimney repair is essential to keeping your home safe and beautiful. But what if you need to repair your chimney? Or what if you have a missing crown? Help your chimney last for decades with quality repair and maintenance. The chimney crown at the top of your chimney covers and seals the top of the chimney. Water is the number one reason that a chimney falls into disrepair. A chimney crown is tantamount to protecting your home from precipitation, critters, and debris. Hiring a chimney repair professional to replace a missing crown is necessary. 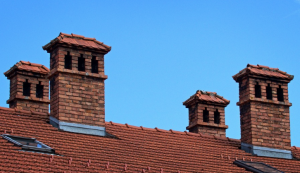 Figuring out if you are missing a chimney crown is simple. You don’t need to climb a ladder. All you need to do is look and see if you are missing the crown. If you are, then take the steps needed as soon as possible. Call a professional and set a date to restore your chimney. At the same time, you can take advantage of other services like sweeping the chimney, repairing broken bricks, and restoring any structural damage. You should inspect your chimney at least once a year, and it may be convenient to schedule this at the same time that you replace your chimney crown. Maybe your home has a chimney crown but it is defective. It can be cracked, have structural damage, or just might be filled with mold, debris, and buildup. A quality chimney crown (sometimes called a chimney cap) needs to slope away from the flue. There should be room for thermal expansion of the liner. Corrosion can cause damage to the crown. Contact a professional before leaks and water damage destroy your chimney and home. Experienced inspectors will check the chimney crown closely for any cracks or damage. They can replace a missing crown and ensure that you have the highest quality materials protecting your home. Call a professional today.